I’m happy to report that I’m nearing the end of my foyer makeover! If you’ve been keeping up with my to-do list (it’s at the bottom of the post), then you know that I’ve been referring to the wall going up my steps as a big honkin’ wall. And that’s exactly what it is. This wall…it mocked me, intimidated me and terrified me! But, I finally followed my own advice and came up with a plan. This is the wall I’m trying to work with. BTW – here’s your first look at the new chandelier. LOVE! You can see the old one sitting on the floor. I was torn between adding another board and batten wall to this side of the foyer, creating a gallery wall or simply adding two or three oversize pieces of artwork. I was trying my best to avoid doing a gallery wall because they’re really hard for me. In the end, I decided that’s what would look the best though, so I tried out several arrangements and lived with each one for a few days to see which one I would like the best. The first thing that I did was to determine where I would want the bottom, sides and top of the gallery wall to be and then framed it out with painter’s tape. This went a looong way in helping me to visualize what I was hoping to accomplish. For reference, I started out in the bottom left corner at the landing, with the straight, horizontal, line being 36″ from the floor. I then marked that same distance at the lower right hand side and ran my painter’s tape in an angled line down. I then placed the tape up the sides, to the height that I wanted. The last bit was to add the top pieces of tape. The first layout wasn’t quite right, so I squared up the right side a bit. Much better. Next, I raided my attic for frames that I thought would work. They needed to be relatively flat because we are constantly hauling things up and down the steps and I’m hoping to avoid knocking anything down. This is the arrangement that I actually wound up with. Sort of a combination of the first and second taped out areas. The next step was to remove the existing artwork from all of the frames and to paint them all the same color – black. That will help to give the wall a cohesive look. If you compare this photo to the one above it, you can see that I switched a couple of the frames on the left side. Boy, did I have a lot of nail holes to fill and touch up! Here’s a look at what the gallery looks like from the top of the steps. It took a bit of trial and error, but I think that I’m going to love the result! Now, I just have to fill all those frames up! I have some ideas in mind, but it’s going to take me a while to complete. Stay tuned! Caulk and paint the board and batten wall white, to match the trim. 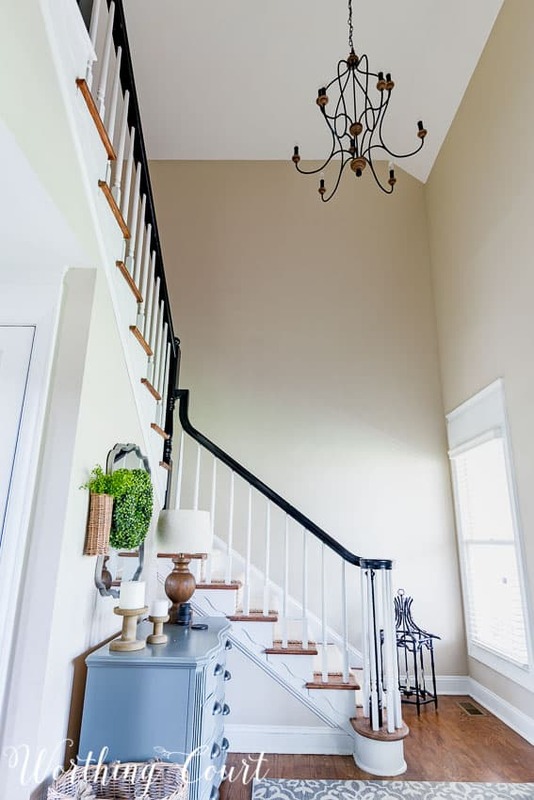 Replace the chandelier, add sconces to either side of the doorway into the office and add a matching flush mount in the hallway at the top of the stairs. Replace the area rug. The current one just isn’t working well with two dogs. Add hooks to the board and batten wall to the left of the office opening. What am I going to do on the board and batten wall to the right of the office opening??? Build (maybe) two benches – one for each side of the office opening. Do something on the big honkin’ wall going up the steps. Gallery wall??? Add artwork to the gallery wall frames. Made a decision about whether or not to add sconces to either side of the mirror above the gray chest. Add an outlet inside of the coat closet. That’s where our modem and router are located. See that extension cord running around the wall beside the gray chest? Add some sort of drapery or shade to the window at the bottom of the steps. Replace the smoke detector in the upstairs hallway. That is gorgeous. I have a similar wall and I put up a quilt. This is an awesome arrangement! Thank you. I love your blog and you are the first one I have ever written to you. I love your one on the dough bowl. It was like it was coming out of my mouth. I gave my dough bowl to my daughter & now I can’t find one in my price range. I really would like to stay under a $100. Where did you find yours? I got spoiled from one from Decor Sales. So reasonable. I think it was about $70. Pottery Barn is not in y budget. I just sent one back from Wayfair. I value your opinion.Thanks. Hi Barbara. I found my dough bowl at Decor Steals. They had one again a week or so ago, but it looks like they aren’t available anymore. 🙁 Hopefully, they’ll bring them back again soon! Love the arrangement. You have solved the problem for me at our daughters home. Thanks for all the details. Love your gallery wall – you made a good decision. I enjoy seeing the process that you go thru to get it to the results you love. I can not wait to see it all finished. Enjoy the weekend. Thanks again for the inspiration. I have a wall that intimidates me too. I like the process you went through and the list you made to get to exactly what you want. I love gallery walls. And you are approaching it so logically, a great idea. I always just start hanging stuff! 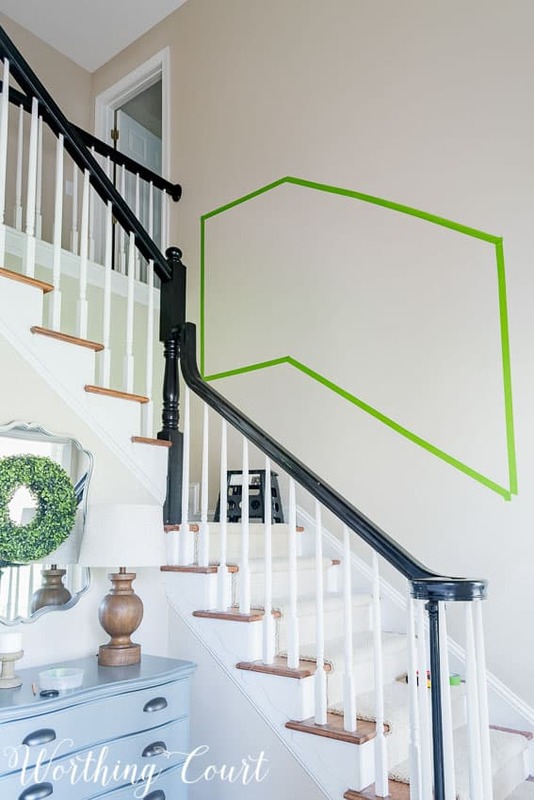 What a great idea to tape off the area and work with that. I am anxious to see what you put in the frames. The gallery wall is beautiful. Thanks for the valuable tips!! Your wall has inspired me to do another arrangement. If you are not familiar with the command strips for picture hanging they are wonderful. I was leery at first and put strips on all for corners of the frame. These frames never moved or shifted and we moved a lot of stuff up and down the stairs. When I moved down the pictures came and no marks on the wall. Replaced the wall side of the strip and are using again. I actually cut sizes of the frame out of paper and stick up using blue tape then use the paper corners to place the wall part of the strip. Hope this helps anyone wanting to do a grouping. Gallery walls are hard to get right. Yours will be awesome. Great job on the arrangement! Always love your attention to detail. I am a detail person, so I understand and appreciate the time you take with each project to get it just right. Looking forward to seeing the finished foyer. 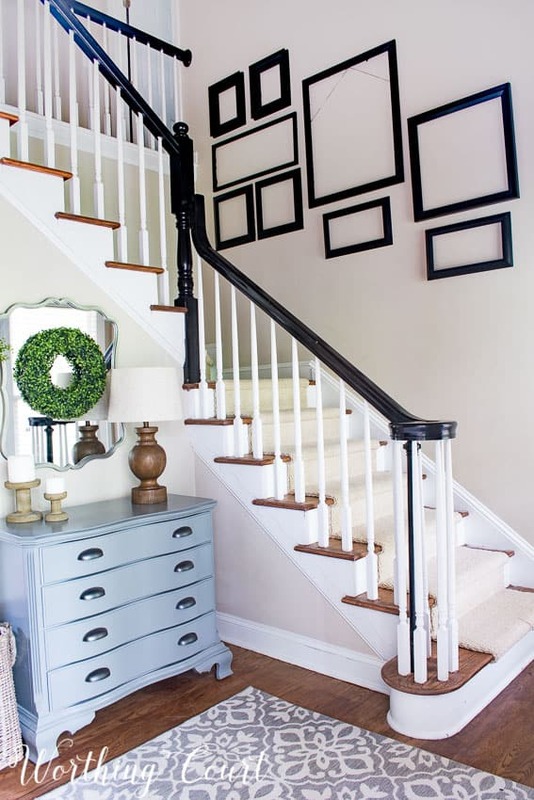 I think your gallery wall looks great! I can’t wait to see your finished foyer! This tutorial is jut what I’ve needed to get going on my gallery wall…very helpful, thanks! Thanks for the helpful idea of using tape to outline the area for frame placement. This is just the idea I needed to get started on my hallway. OMG, thank you! Great idea! I would love to do a gallery wall on a large wall in my living room. Your advice on how to start the planning is a great help. Thanks much. I love your staircase wall order. It looks great from either direction. 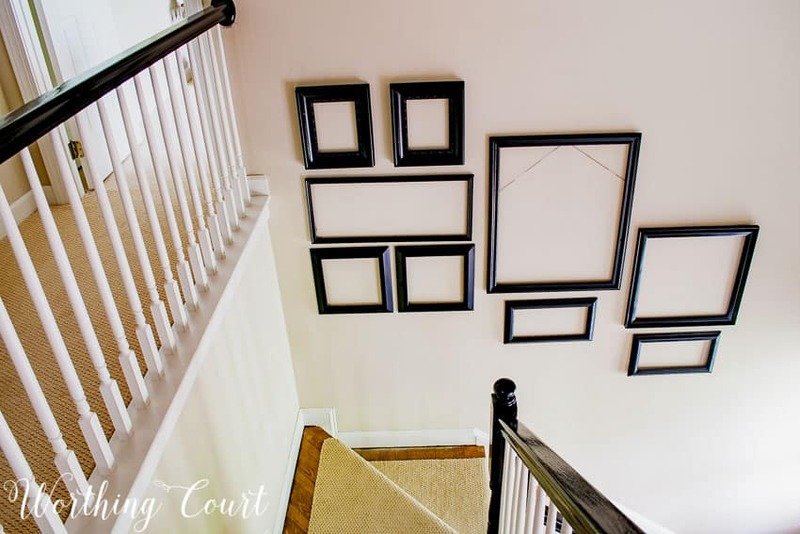 I love that you repurposed frames for the gallery wall; It looks amazing! “‘ them through out the display. I enjoy this collection daily and have received numerous compliments on them. I know when it is all said and done you are going to love your wall as much as i love mine! Great tips!!!!! I didn’t know where to start with mine. Now I do!!! Thanks! 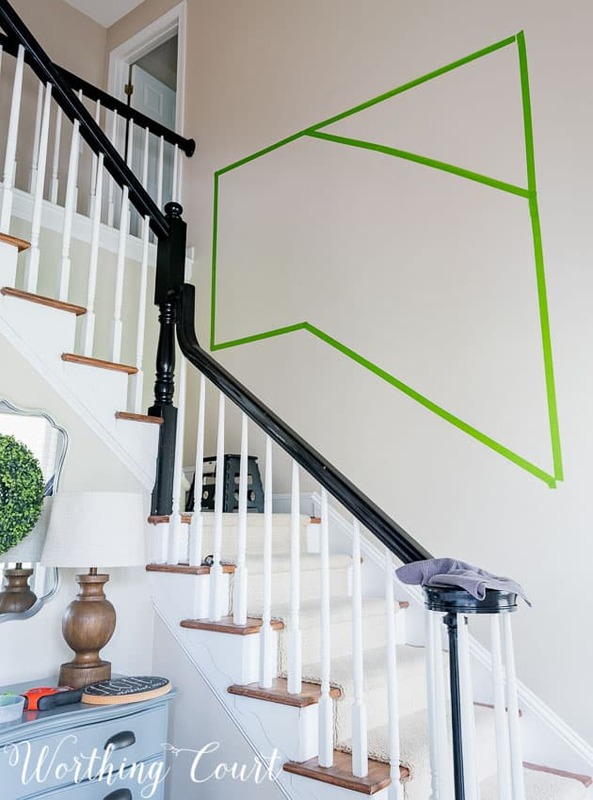 I love how you used painters tape to figure out your space, what a smart idea. I can’t wait to see the finished wall! My daughter is making a gallery wall and I love your layout. Thanks for sharing with us at #overthemoon link party. Have a great week! Loving how t looks so far, it’s gonna be great! The new chandelier is perfect too. You’re doing a wonderful job. Very cool gallery wall! Looking forward to seeing it totally finished. Wow! Your list is almost done! You go, girl! This is going to be beautiful. Great job. I’m so glad that you shared this! I have an empty wall in my living room that I want to make a gallery wall but it’s so hard to know even where to start with it. I’m definitely going to try your tape idea and see what I can come up with! Thanks for sharing. This is an informative post to see what your process was with regards to measuring and taping the shape of the gallery before hanging the frames. The end result looks very nice. I also appreciate seeing your to-do list, as it helps to give me ideas about carrying out a project. Thanks for revealing your behind-the-scenes processes. It looks beautiful! I have been meaning to put up frames on our stairway but haven’t yet done it. This post is really inspiring. Thanks a lot for joining us at the Family joy blog link up party. Pinned. I’m ready to give this a try. Nice detailed instructions. Love all your posts; always inspiring. I especially LOVE your board and batten wall and the gallery on your stairway wall. It turned out great! Thanks for sharing your ideas! Taping off the area is such a great idea! Creating a gallery wall has been on my to-do list for awhile and this gives me a great starting point! Thank you! Pinned and sharing. Thank you for joining us at Family Joy Blog Link-Up Party. I hope you will join our next party starting Sunday at noon EST. Thank you for the wall gallery tutorial. I wanted to try one myself but didn’t know how to get the right look. Your tutorial has given me the confidence to go ahead with this project! This is such a great tutorial for making a gallery wall. Thanks for sharing it. I linked it up on our create link inspire party. Thanks for joining us! Want to try this. Time to collect frames. What a great idea using tape first. 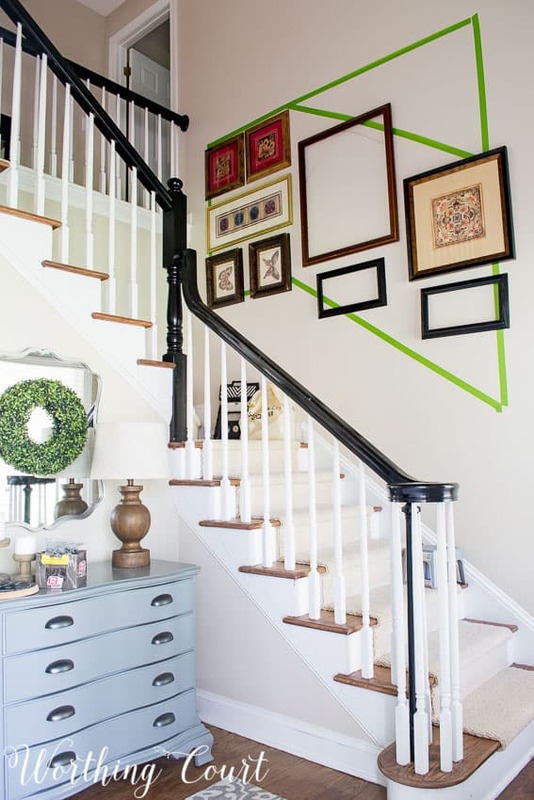 I’d like to do something similar with my stairs, but the area is a lot smaller than yours, and I’m worried about it making the stairs look smaller! I’ll definitely get the tape out first and try that to see how it looks. Thanks for the advice! 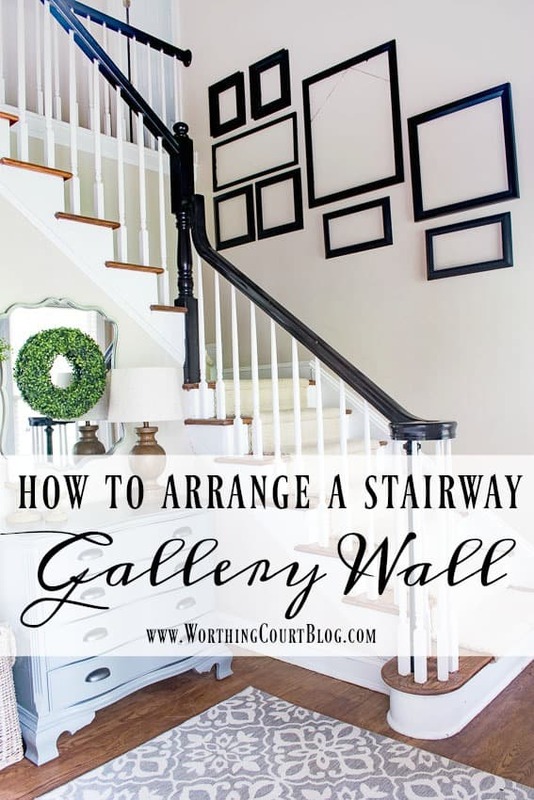 Great post on arranging a gallery wall. My situation is thus and I need advice: I have about 12 8×10 studio photographs of me from 1 year to 38 years of age. There is one oval 11×14 and 1 5×7 oval. As it turned out, all the backgrounds are done in a subtle light aqua tone-not planned, just happened that way-guess that shows off the red hair. The question is: Should I place the frames on the wall by chronological age, from 1-38 or should that be random selection, discounting the age? Really stumped on this-don’t want it to look too mixey/matchy in the process. Your advice would help so much. Thanks! Hi Margaret. My apologies for not responding sooner! Based on your description, I think it would look less matchy-matchy if you mixed them up, especially since you have some different shaped frames.